I’ve heard it said that putting together a big project such as a magazine is like giving birth, and last year while working on the 2017 issue of Easy Weaving with Little Looms, I put that idea to the test. With just a few articles left to edit, I stopped work on the issue a bit earlier than planned to give birth to my son, Henry. I can now definitively say that while I am very proud of both accomplishments, the two are nothing alike. For one thing, you rarely lose sleep after your magazine is born. 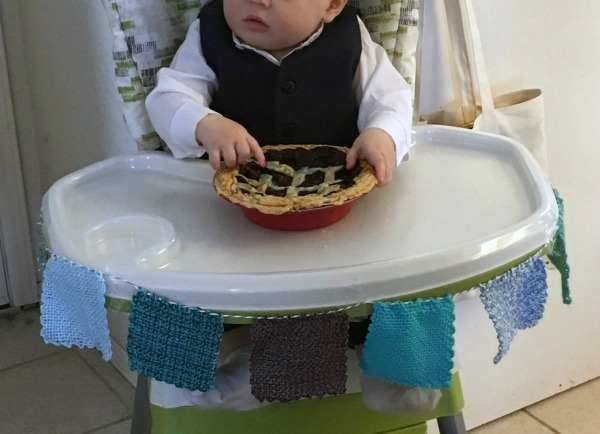 Henry with his birthday banner and coordinating blueberry pie. I’m happy to say I worked on Easy Weaving with Little Looms 2018 from start to finish. This year’s issue began with choosing themes for the project sections: At the Market, For the Home, and On the Town. In these sections, you’ll find projects to decorate your home and your wardrobe, including colorful towels, durable—and delightful—tote bags, elegant shawls with just a hint of sparkle, and much more. You’ll also learn how to finish your handwovens in style, from simple knotted fringe to clever hemstitching techniques. As always, we’ve included information about equipment, tools, and yarns, and put a spotlight on some of our favorite designers. For the beginning weaver or for one with a bit of experience who is looking for better ways of doing things, we added articles about starting to weave and how to fix mistakes. As you continue your weaving journey, I hope you use the projects in this magazine to learn and grow—to try new looms, fibers, and weaving techniques. Most of all, though, I hope you have fun.